BugDoc Dave here! In my last Stretch Tuesday, I covered the “colonial” candleholders made by Fenton, Northwood and Vineland. Tonight, I’d like to show how these candleholders were meant to be used – in console sets! Our Stretch Glass Society will be holding their convention in Marietta, OH again this year from July 27-29. Our club display (we have a tradition of selecting a theme and have our members bring examples to assemble in one large display) is console sets, so I’d like to give you a taste of what is to come! 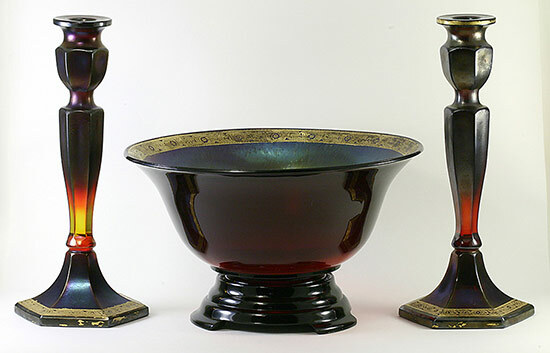 Console sets generally consist of a bowl (usually on a glass stand, but it may be a low-footed bowl) and a pair of candleholders. 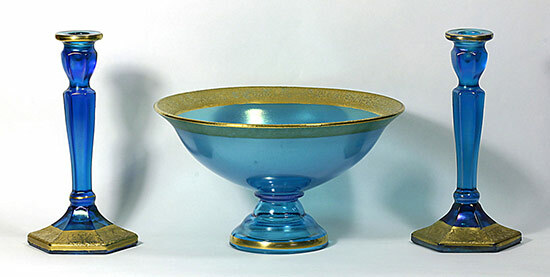 It is obvious that all of the companies (except for Jeannette) made candleholders and bowls that would easily make console sets. In fact, most of the companies who ran advertisements in various trade journals of the time showed bowl and candleholder sets. We also know of certain lines of stretch glass that have similar numbers or patterns that would identify them as console sets. 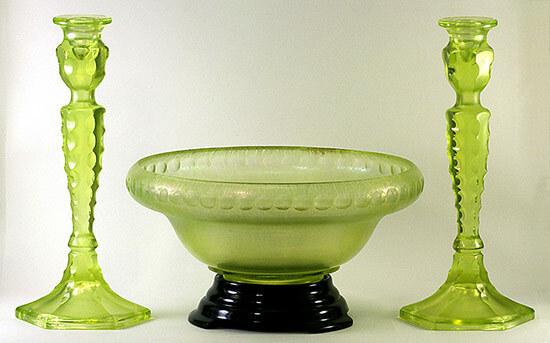 A good example of this would be a set of Fenton “cut-ovals” candleholders (in this case, a #647 bowl and pair of #349 candleholders in Topaz). 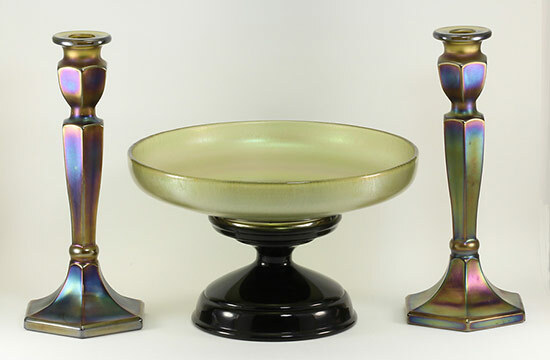 In the next set, Fenton appears to have sold a similar set to a decorating company (likely Wheeling Decorating Company) who put an acid etched design around the bowl rim and the bases of the candleholders (a flared #647 bowl and the #349 candleholders in Ruby). 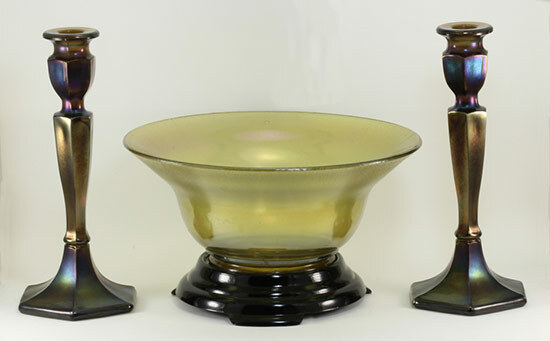 Smaller bowls were used with the #449 candleholders (the 8-inch tall ones). Northwood actually figured a couple of console sets which I have reassembled here. 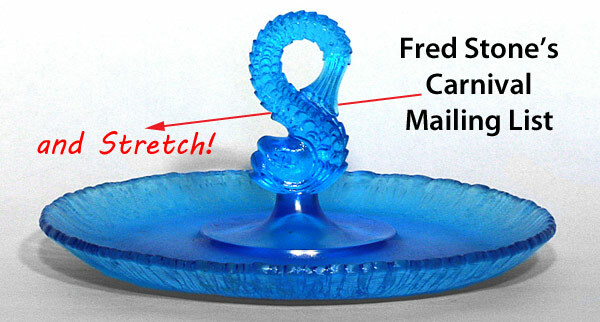 The first one uses a footed bowl (#721, 10-inch wide) and a pair of #696 candleholders (the 10-inch ones). Notice that this set has what is called glue-chip decoration that has been overpainted with gold paint. Glue-chip decoration is made by painting what was called “fish glue” in the surface of glass. This was then placed in an oven and the glue shrinks pulling off flakes of glass. When held up to the light, the effect looks like frost on a window. The next set uses a #641 bowl (9-inch wide, low or “ice cream” shape) set on a high-standard black base. The #696 candleholders are also used to complete this Russet colored set. I can imagine the fresh fall fruits arranged in the bowl. My last set is from Vineland but we don’t know the numbers or names used by this company though three bowls have shown up, each with a paper label. The labels give a number which has been different on the bowls and color names. So, we have three of Vineland’s color names – Tut Blue (a Celeste Blue type), Wisteria (a nice purple), and Old Gold (an amber color). I’ve assembled my Old Gold, 12-inch wide bowl with a pair of the Old Gold “colonial-style” candleholders. We also have determined that Vineland also made black bases and two have been identified. These are very similar to some of Fenton’s bases, but they are a slightly different size and the feet are a bit different.